HNB signed a strategic cooperation agreement with Hotbit in Vietnam yesterday. On the 25th of April HNB will launch on the Vietnam Hotbit Exchange. 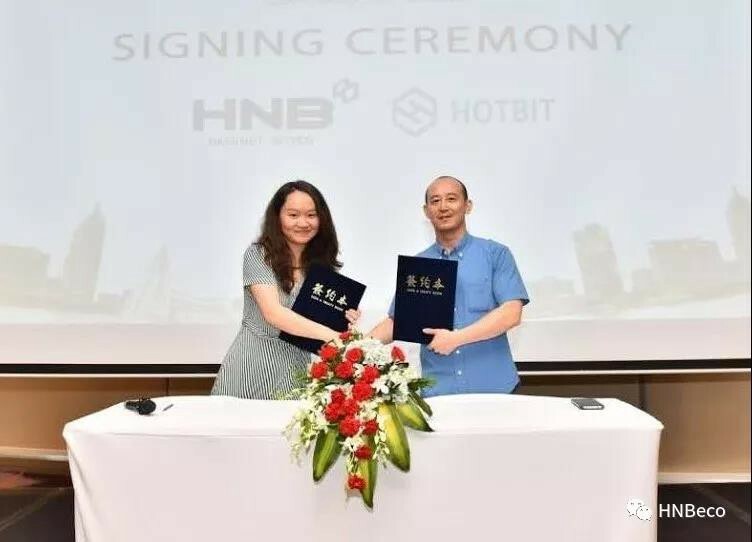 International professional digital asset trading platform Hotbit and HNB officially signed a strategic cooperation agreement at the Blockchain Innovation & The Future of Opportunity event in Ho Chi Minh City, Vietnam, and announced that on the 25th of April HNB will launch on the Vietnam Hotbit Exchange. As a partner of HNB IEO, Hotbit is a professional digital asset trading platform, using GSLB, distributed server cluster, distributed storage, a multi-machine high-speed memory transaction engine, cold wallet, private wall offline hot wallet, etc. Advanced technology, providing secure, stable and reliable digital asset trading services to customers with multiple terminals such as web, mobile, and PC; and with high transaction volume and active community: average daily transaction volume is 90 million The US dollar, with a maximum daily trading volume of $150 million, has more than 1.5 million user visits and more than 350,000 user registrations per month (according to data on the CMC). As a decentralized economy, HNB aims to use the blockchain technology to empower the real economy. Within its economy, it adopts a dual-generation currency (asset currency HNB and currency HGS) structure and realizes asset unification through cross-chain communication in a double-chain manner to serve the community economy. At present, DNB (HNB Mall) developed by HNB has exceeded 200,000 downloads at home and abroad; it has successfully settled in nearly 100 eco-businesses such as KENZO, fashion BAZAAR, and Longmi, and has nearly 10,000 SKUs on the line; in terms of community, members of the community at home and abroad still In addition, the HNB community has successfully introduced the HNB DAO (Decentralized Autonomous Organization) concept to guide community members to participate in community governance and promote healthy and sustainable development of the community. HNB believes that with the launch of IEO, the platform business scenarios and HNB intrinsic value will be improved. At the same time, Vietnam’s largest blockchain and business community, including VIC, KTC, BBC, Saigon Tradecoin, etc., with about 100,000 member community members, will launch a large-scale text and video promotion for HNB IEO in the local area to expand HNB visibility. At the same time, it provides support for technical services and other aspects to help IEO; and will help HNB expand into the local business market. Follow us on Twitter to stay up-to-date with our latest announcements. Join our official HNB Telegram group to join the conversation with our community and team members.